I never thought I’d see the day when BOB would make a light weight 4-wheel stroller, but here it is. It is called the Motion. The Motion is your “everyday stroller” for parents who like the rugged durability of a BOB with the lighter weight and compact size. Parents who own jogging strollers find them cumbersome to take out on errands and this is where the new Motion comes in handy. 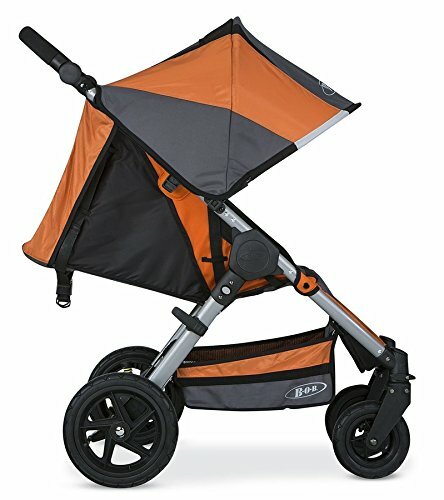 While there aren’t that many reviews for this stroller yet, the ratings are mostly very high, citing the compact fold, easy assembly, huge sun canopy, smooth ride, and quality materials. I’ll go over the reviews in detail toward the end of this review. In the following review, you will get all the details on the fabulous BOB Motion and discover for yourself if this is the right product for you and your child. 2 All about the seat. 3 What about a car seat? 5 How’s the steering and performance? 6 What is the fold like? 8 What accessories are available? 10.1 Where can I buy the BOB Motion? 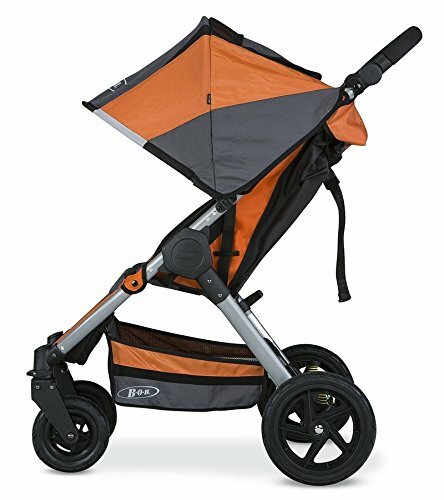 The BOB Motion has a sturdy aluminum chassis that can hold your child up to 65 pounds. This means your child is going to need a bigger seat. The width is a roomy 14″, and the seatback is 18″, rather standard height. Some consumers feel that the seatback isn’t high enough for taller children, though the seatback to the tallest part of the canopy is 26″. If you have a little escape artist on your hands, he or she will find it impossible to get out with the heavy duty harness buckle. The padded, no-threading adjustable harness grows with your child. One reviewer from Dallas, TX noted in her 5-star review that her daughter finds the seat comfortable enough for long naps when they go out. The supportive seat features a drawstring recline that lays the seat back into any position your child feels comfortable with. You can bring the seat down with one hand, but you will need to use both hands to push the seatback forward again. During hot afternoon nap times, if your baby’s laying back in full recline mode, just pull up the fabric in the back to reveal a large mesh window to keep your small passenger cool. This mesh backing also provides extra protection by providing an enclosed area. What about a car seat? 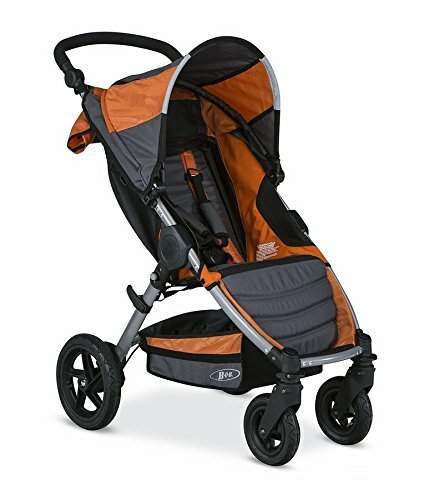 Is the BOB Motion travel system compatible? Yes! You have several options for your newborn’s car seat arrangement. First, you can simply buy the travel system together as a set and save some money. Or if you have a BOB or Britax B-Safe car seat, simply install it with the Click N GO adapters, included with purchase. Or if you have a different popular car seat brand, then get the universal adapter frame, sold separately. I like sun canopy for a number of reasons. Besides being nice and big, like all the BOB stroller canopies, the Motion comes with an extra-large ventilated peek-a-boo window that keeps your baby cool and comfortable during a summer stroll. Easily keep an eye on your little rider during your outing. The canopy is definitely large enough to provide ample protection from the sun and wind and is a favorite with parents who have written in with their reviews. How’s the steering and performance? BOB’s always done well with their high-performance, fixed-wheel joggers and all-terrain Revolution. Superb suspension, tires that glide over all types of terrain. The four tires are made of pneumatic rubber, mounted on high-impact polymer composite wheels with air-filled tubes. I don’t know exactly what that means, do you? But basically, it’s the formula for an exceptionally smooth ride over grass, mulch, and bumpy sidewalks with no problem. Locking the front wheels provides better stability. Air-filled tires give some suspension naturally, but the Motion has independent suspension over each wheel to glide over those bumps. The steering and maneuverability is a highlight and many reviewers write about this as being one of the best aspects of owning this stroller. Brakes are awesome – one step linked brakes engages both rear tires. Flip it back up to disengage. 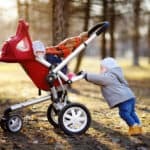 I’ve used strollers before where brakes are a struggle to flip up and down, but the Motion’s brakes don’t require rough handling to be effective. Safety made easy! 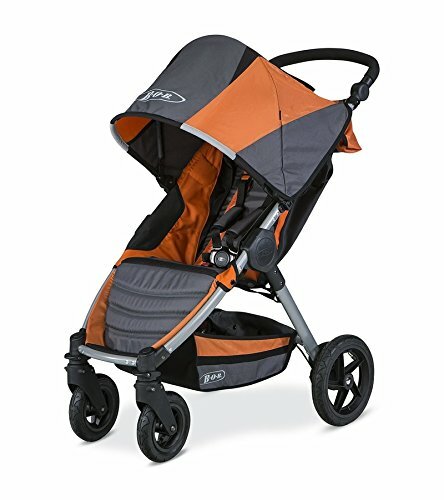 The fold is one of the highlights of the BOB Motion; it is just like the Britax B-Agile. You first push in the grey button on the side, then pull up on the handle in the seat for one smooth folding motion. An automatic chassis lock holds the frame in place, which makes taking your Motion with you very easy to do. Also, if you flip up the handlebar before folding, it is used as a prop support for the stroller to stand upright. Once folded, it is nicely compact, fitting into most car trunks, and you can easily remove the wheels for the smallest trunk spaces. Unfolding is just as simple – just pull slightly on the chassis lock and the Motion practically unfolds itself. The BOB Motion stroller comes with a medium-sized storage basket beneath the seat. It is spacious enough to hold a large diaper bag, but it can be tricky to access through the back because of the curved rear axle. It is much easier to add or remove your items from the sides of the basket because the fabric offers some elasticity. You get more storage space with a huge zippered pocket behind the seat, fully available when the seat is in full recline. The pocket is the same size as the seat back, so you have lots of space to store your cell phone, keys, and even bulkier things like a couple of library books. The handlebar is height adjustable! Yay! From its lowest setting at 32″ from the ground up to 42″, you’ll find a position just right for your height. Parents are writing in their reviews how important – and even a what a dealbreaker – the adjustable handle bar is for them. It has three height positions. A recent review from a mom says that she’s 5’4″ and her husband is 6’4″ and now they both get to have outings with their baby comfortably. Another mom review says she’s 5’2″ and her husband’s six feet tall, so having the adjustable handle is great. Woefully missing from this stroller is a cup holder, though! Most consumers want a cup holder as a standard in their stroller purchase. Fortunately, whatever else you need with your Motion that didn’t already come included, you can buy separately. For those of you living in a cold, rainy, or even windy climate, then the weather shield is a great investment (pictured). The shield completely covers the canopy, too, keeping the entire front and top covered, and your baby dry and away from the elements. For you in sunny regions, the sun shield provides extra shaded protection, and full coverage top to bottom. Not only does it protect from the sun, but from bugs too, if you live in an area with that going on. But what this stroller might need most is the cup holder and snack tray. Parents say on several occasions that they wish they had these, so get them for yourself at the same time you buy the stroller. The cup holder is actually an entire console that you install in the space between the handle bar. And it has two cup holders! You also get a little storage pocket for your keys, lip balm or other small items. There’s also a console with a tire pump included if you’d rather get that; I don’t know about you, but when I have air-filled tires, I’d like a pump handy when I need it! Lastly, for you travelers, yes! You can take your BOB Motion with you on your vacation! The travel bag fits around the stroller quite well, though a few reviewers say they had difficulty doing it. The folded stroller goes in wheels down and the top of the bag zips at the top of the folded seat. So while the few reviews are not that great, the good reviews say that the bag works well. The first video is an official demonstration video of this neat little stroller. Next is a full review of the BOB Motion, but the information about it being available only at REI is now obsolete. Fortunately for us, we can get it at many retailers now! 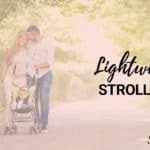 As I’ve said earlier, there are not that many reviews out about the BOB Motion yet, but the reviews and mom blogs out there all give this great little stroller high praise! Parents mention on numerous occasions that the air filled tires are the biggest deal with a smooth ride going over bumps and very easy maneuvering. Don’t be intimidated about getting your BOB stroller delivered in a box. Several reviews mention how easy it is to assemble. Just remove it from the box, take off some plastic bits and pop on the wheels. No need for stress about this one! And lastly, the feature getting the most attention is the adjustable height handle. Many couples are different heights, so much that it really does interfere with a comfortable stride for one, but a hunching over, stroller-kicking experience for the taller partner. With a 10-inch span from highest to lowest setting, you will find the position that suits you. There have only been a few complaints, but the complaints are about the same issues. You have to buy all your accessories separately. Parents expect a cup holder. They also like having a snack tray for their child, or at the very least a little pocket inside the seating area. The only other consistent complaint is about the storage basket. Parents want it to be bigger and hold more. They want to be able to access it easily from the back, not just the sides. Where can I buy the BOB Motion? So far the best online retailer I’ve seen selling the BOB Motion is on Amazon. You can’t go wrong with prompt free shipping and fantastic service. Can you just see yourself right now gliding this marvelous stroller around your neighborhood?